A first-person physics-based puzzle game in which you manipulate designated cubes in the environment to create platforms, barriers, springboards, and more in order to solve a series of puzzle rooms. In many ways, it’s an expanded and refined followup to Q.U.B.E: Director's Cut , though not all the changes are improvements. 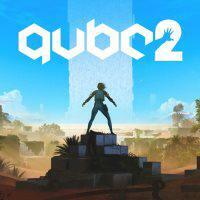 Where Q.U.B.E: Director's Cut is a solid puzzler elevated by its story, Q.U.B.E. 2 is just a solid puzzler. Mechanically, Q.U.B.E. 2 has a stronger identity than its predecessor. From the beginning, you have the ability to place cubes in designated spots, not just activate them. This gives puzzles an extra layer of thought and agency and means you have a consistent set of tools you bring to every situation regardless of what other factors and mechanics are involved. Puzzles get more elaborate with more mechanics as the game goes on, but ultimately every puzzle is about using your tools to open doors, raise platforms, or otherwise reach the goal. The complexity of some puzzles can be a double-edged sword, as there are often several steps that must be performed in specific sequence with specific timing and it’s frustrating to have to start all over if you make a mistake near the end. An undo or brief Braid -like rewind ability would have gone a long way. The problem is made worse by the fact that the game’s physics are not quite 100% consistent and doing the exact same thing may sometimes have slightly different results. Normally this isn’t a problem, but it sometimes means you can do the right thing and fail anyway. In these cases, it’s hard be sure whether your approach is wrong and you need to rethink it or you actually got it right and just need to do it again - which is a terrible thing for a puzzle game to do to you. The environment is beautiful and more varied and colorful than before, but the story has taken some steps back. It’s still mostly delivered through radio transmissions between puzzles, but it’s less cohesive this time around. Despite a few powerful moments, it doesn’t add up to much of anything satisfying by the end. Also, be advised that for some reason there is no chapter select and seeing an ending locks out your save file, so if you want to see multiple endings on a single playthrough, back up your save file before the final choice - you’ll know it when you see it.